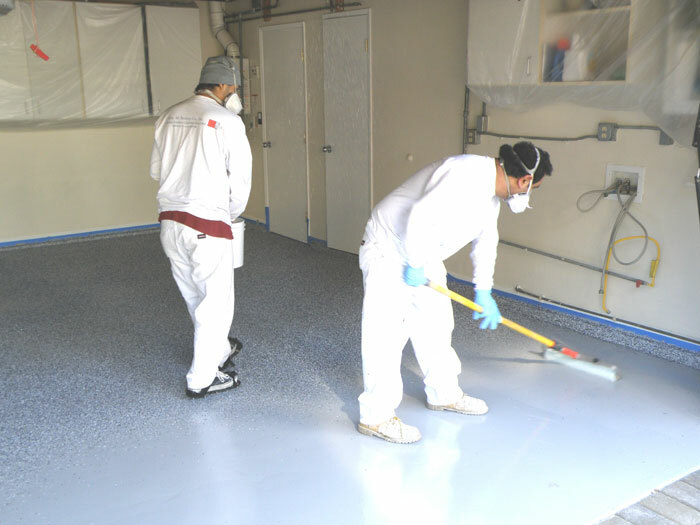 When you purchase a SpartaFlex floor coating from Perkins Custom Coating you doing business with a 3rd generation family owned and employee owned company that has been doing business in Southern California since 1969. Your floors will be installed by technicians who are factory trained and certified by the manufacturers of SpartaFlex coatings. These English speaking and courteous employee-owners have completed hundreds of installations of SpartaFlex floors in San Diego, Imperial, Orange and Riverside counties over the past year. They use only the most advanced dustless diamond grinding and shot blasting equipment available on the market today. The installation process actually begins during the initial site visit to your property. 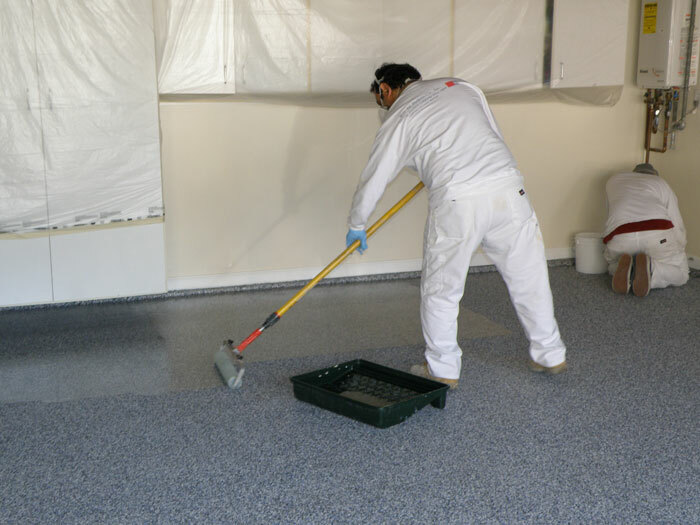 Our expert sales people with years of experience will assess the conditions of your floor and attempt to determine whether there are any concrete moisture, cracks, oil or other contaminants present in the floor that will require special treatment. In order for us to provide you with the strongest warranty in the industry, we will only install your coating after any of these issues are resolved. 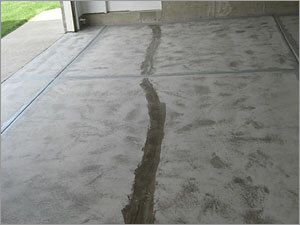 Many homes in southern California built during or before current day have some minor or major concrete slab cracks. Ten years ago, this was a much more serious issue than it is today. 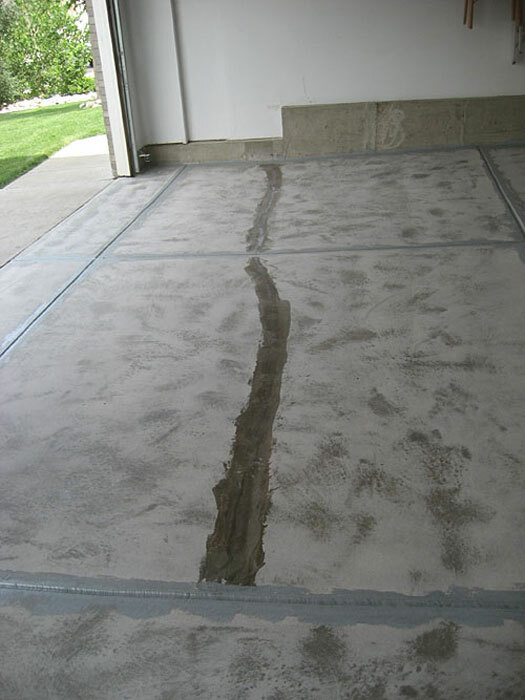 Perkins Custom Coatings uses some of the concrete industry’s most advanced crack repair technology to repair any cracks in the concrete before we begin the installation of the floor coating. Our crack repair products do not have any strong odors or harmful VOCs (so they are environmentally friendly), they can be used on either larger or smaller cracks and are designed to be fast curing and provide a ultra-long repair beneath your new floor coating. While they will not prevent the formation of new cracks, they are generally very successful in stabilizing existing cracks in slabs that are not subject to excessive movement or seasonal expansion/contraction. 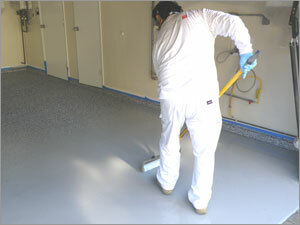 Homes built in southern California prior to the early 2000s were not required by code to have a plastic membrane installed beneath the concrete slab called a “vapor barrier”. As a result, over time ground moisture “wicks” up through these older slabs to the surface causing them often to exhibit visible moisture defects including efflorescense (which typically exhibits itself as a white, chalky mineral type substance found on the concrete slab) or mildew. 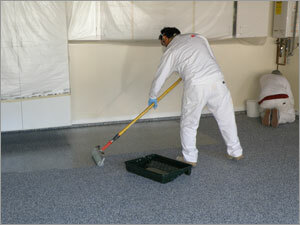 If this moisture issues is not treated before a floor coating is installed, the moisture will eventually cause the premature failure of the floor costing installation. Perkins Custom Coatings uses a number of products designed to work as a moisture and vapor barrier beneath our polyaspartic floor coatings that work so well that in many cases, we are able to offer a “moisture warranty” for our installations – something no other company locally is offering. Since moisture is the most common reason a floor coating will fail, don’t you think you should have a warranty that protects you from moisture failure instead of finding out after it is too late that your warranty excludes moisture related failures? Perhaps the most common situation we run across during an floor coating installation assessment is the presence of oil and grease. 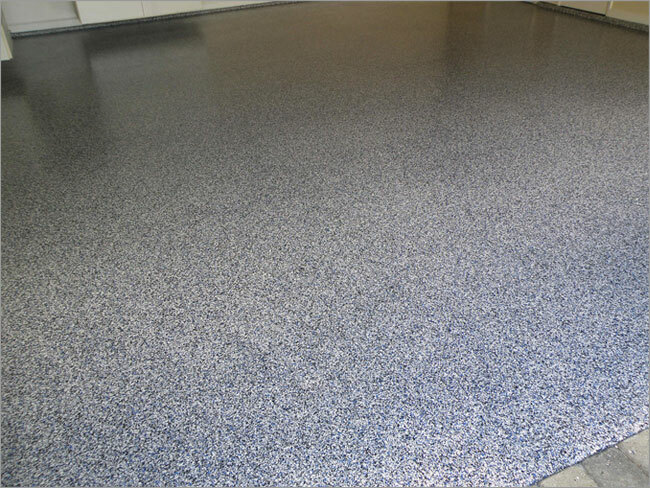 Fortunately, there are some very strong and powerful degreasers and emulsifiers that can soak into a oily or greasy floor and lift the oil and grease to the surface within a few hours. These products are 100% non-toxic, do not have any strong odors harmful VOCs and work quickly. All finished concrete slabs have a top layer of “cream” close to the surface of the slab. 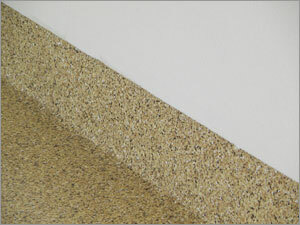 The cream is what allows the concrete to become smooth and gives it that “finished” look. 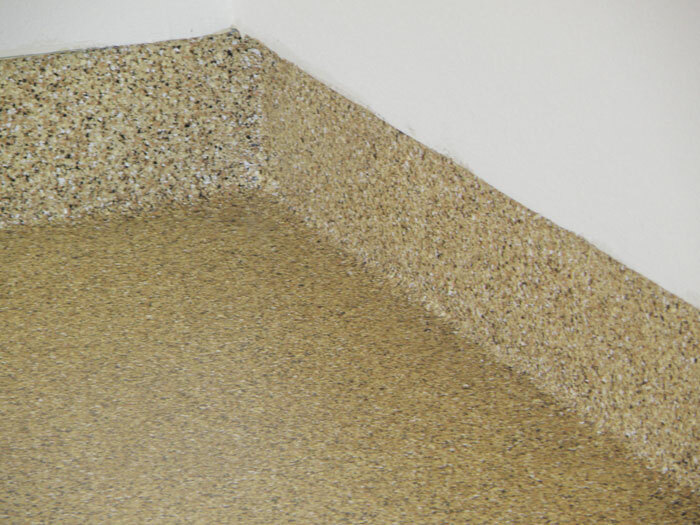 However, for a floor coating to “bite” to a concrete slab, the cream must be opened up ever so slightly to expose the higher profile aggregate beneath the cream. This is accomplished by either lightly grinding the slab with an advanced dustless concrete grinding system or using a dustless shotblaster. Both of these processes basically “open the pores” of the concrete to allow the prime coats of material to bite to the floor (shotblasters are typically used where there is presence of latent moisture whereas grinding is typically used where moisture is not a problem). Don’t worry about dust. Our dustless surface preparation will typically capture about 95% of any dust generated by this process and we will thoroughly vacuum and clean any surfaces that are not masked off. Among the many things that help make SpartaFlex unique is its ability to be installed on horizontal as well as vertical surfaces. 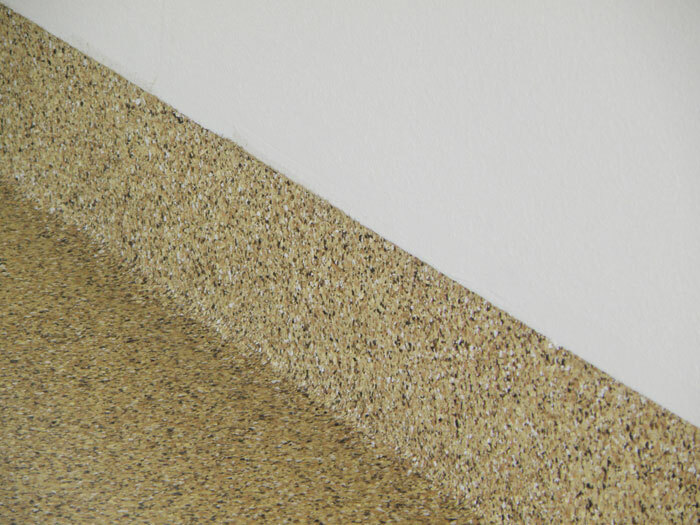 In addition, through the use of a fast curing and easy to apply product that has the same zero-odor, zero-VOC qualities that SpartaFlex has, we can mold a “coved” base finish in the corners where the wall meets the floor, creating a neat and easy to maintain edge that is visually attractive and functional at the same time. If moisture is an issue, Perkins Custom Coatings will apply a moisture control system beneath your SpartaFlex floor coating. 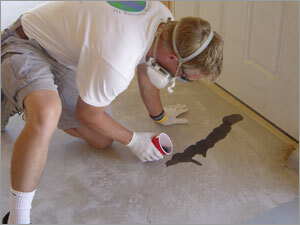 Typically, these products do add a day or more to the installation as well as the cost of applying them. However, the materials that we use are so effective, we are able in almost every case to stand behind them with a moisture warranty – something very unique in our industry. If moisture is not an issue in your floor, we will apply a tinted prime coat of a product especially designed to penetrate and bond to the prepared concrete slab and allow our SpartaFlex materials to bind to this prime coat. 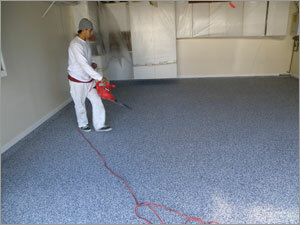 After the prime coats are applied, we apply 1-2 coats of 100% solids SpartaFlex over the broadcast colored chips. These chips are specially designed to be UV stable and come in a wide variety of colors to allow you to match your floor color to the décor of your home. We carry over 20 different colors and sizes in stock, have another 20-30 available within 1-2 days and another 100 or more available direct from the manufacturer. Our customers tell us that they love our wide selection of chips and appreciate that we carry so many in stock ready for immediate installation. After the final coats of SpartaFlex are applied, we will be cleaning and re-packing our equipment. 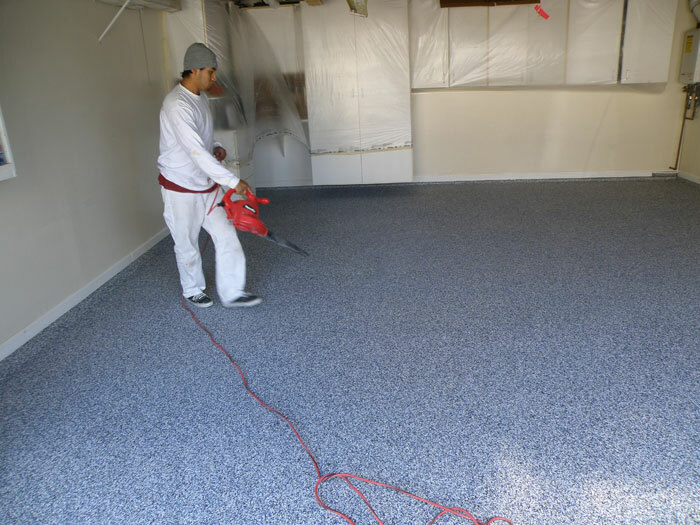 Within about 1-2 hours after the application of this last coat, your new floor is available for light foot traffic so that your light-weight personal belongings can be returned to the area. The next day, 24 hours later typically, you can drive your car on the floor. While dry to the touch within a few minutes, SpartaFlex will continue to cure over the next 28 days until it is completely cured. However, you will not notice this curing since SpartaFlex exhibits excellent resistance against hot tire pickup within just 24 hours!